“Big Sur seems to have that same effect on its visitors. One can only imagine the spoken-word stories that might have sprung from the California coastal region in the ’60s, when Jack Kerouac spent a few weeks with delirium tremens in his friend Lawrence Ferlinghetti’s cabin and lived to tell the tale in his novel “Big Sur.” New York Times, June 11, 2014. “The experience is designed to be “totally immersive.” Lighting will be limited to candles. Bringing blankets is encouraged. The only rule, according to Toren, is participants must not distract from the experience. The key, he says, is that everyone remains in the narrative.” Monterey County Weekly, June 12, 2014. “‘When I started talking to “The Moth,” “Wiretap” and “This American Life,” every time I spoke about it they said “What are you saying? Outdoors, underneath the redwoods, on the coast of California. Can I come?” Toren said. “So I said, ‘Of course you can come.’ Since then it has taken on its own life with enthusiastic support from radio content producers around the country.” Santa Cruz Sentinel, June 11, 2014. “Toren believes Big Sur is the perfect backdrop, for its literary foundation, its view and its timelessness. ‘It symbolizes a place of aspirations and hope. Things don’t move as fast, things are quieter. There is a sense of space that is nurturing and doesn’t change too much. It’s stable and it’s comforting that way. You start asking the existential questions. '” Monterey Herald, June 11, 2014. BSS&S is brought to you by the Henry Miller Memorial Library, a 501 (c) 3 non-profit art center in Big Sur, CA. 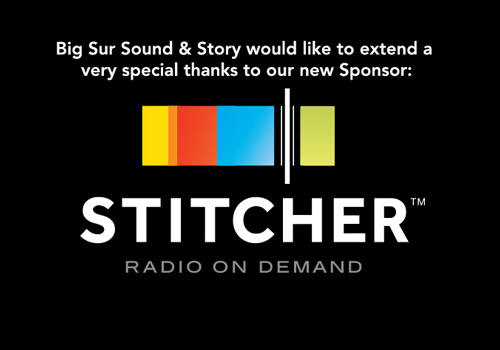 Announcing our new sponsor, STITCHER. Radio that instantly connects you to any conversation! Our series is also sponsored by, KUSP, public radio for the Central Coast! Radio legend Bob Edwards has joined our Jury! Reserve your post at upcoming installments!!! Click HERE to reserve your spot at upcoming Big Sur Sound and Story installments! Admission is free (donations accepted)! Check out audio previews for upcoming installments on Stitcher here!